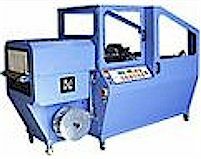 A small and compact Auto L-Bar sealer with high performance shrink tunnel combined together to give you maximum flexibilty with a high level automation. The Unica 40 has a total length of 2.23 meters and the Unica 60 is only 2.83 meters. The sealing system is a constant heat sealing blade and is electronically controlled, both machines have a memory function that can store 20 different pack sizes.